There seem to be two general approaches to plotting a novel. When I was younger, my efforts consistently ran aground because I tried to fit myself into the outlining and pre-planning camp. When I first learned to trust imagination and revel in the lets-see-what-happens-next process, I finished a 90,000 word draft in seven months of evenings and weekends. The good news is, I’d found my natural way of working – the bad news is it took me seven months to see the gaping plot flaws an outliner could have flushed out in a couple of weeks. I undertook a study of plot and learned about the three act structure, the key plotpoints, and various other fundamental concepts. What I still didn’t have was a method of planning that didn’t inhibit imagination, the way an armature supports a ceramic sculpture but doesn’t inhibit expression. Ingermanson begins by suggesting a one-sentence synopsis of the entire story – something that may seem impossible at first, but which I now believe is absolutely necessary. The process clicked into place for me when I saw, on another web site, the following example offered for The DaVinci Code: A late night murder in the Louvre leads to the discovery of a secret the Vatican has tried to suppress for 2000 years. Very high-level like that. Ingermanson then suggests growing this story summary to a paragraph and then a page, in the spirit of discovering what the story is really about. If the villain isn’t bad enough or is too easily defeated, it’s worth knowing upfront rather than thousands of words later. Once I have gone as far as I wish with the Snowflake Method, I’ve got a decent high level map of plot and perhaps my protagonist and villain, but for me, something is still missing – how do I find out what’s going to happen next? How do I dream up new complications, discover and weigh alternative endings, without writing those thousands of practice words? 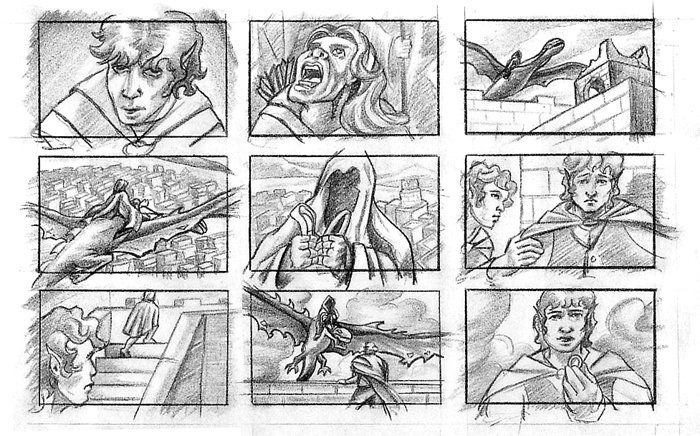 I’ve recently begun to explore something I saw a decade ago, the “storyboards” Peter Jackson and his team developed to map the scenes of The Lord of the Rings. This was part of the “making of” section of the DVD’s. 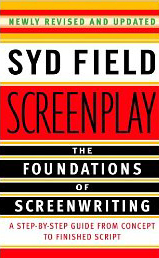 I dug them out and watched again after recently reading Syd Fields’ excellent, Screenplay: The Foundations of Screenwriting, which recommends using 3×5 cards to work out plot. I find that either a quick sketch or a few words can sum up a scene in a graphic manner that appeals to imagination. I can carry a few cards in a shirt pocket and glance at them over a cup of coffee or mull them over while driving home. After witnessing Frodo confront the Nazgul, Faramir releases Frodo, Sam, and Gollum to pursue their mission to Mordor, or simply, After Nazgul, Faramir lets them go. I find that if I let the images play around in the background of my mind long enough, the next step will come, and often surprise me. I fully expect this process to evolve and change, but for now, this is a huge step forward. This entry was posted in Characters, Novels, Writing and tagged fiction, plots, screenwriting. Bookmark the permalink.